Join us for an unforgettable New Years Party in the heart of downtown San Diego. DJ, drink specials, NYE photo booth and midnight confetti drop with hundreds of amazing party people. This is a private, exclusive event with limited tickets available. Tickets start at $35 (the best NYE deal in the Gaslamp) and will increase in price until the event is sold out. 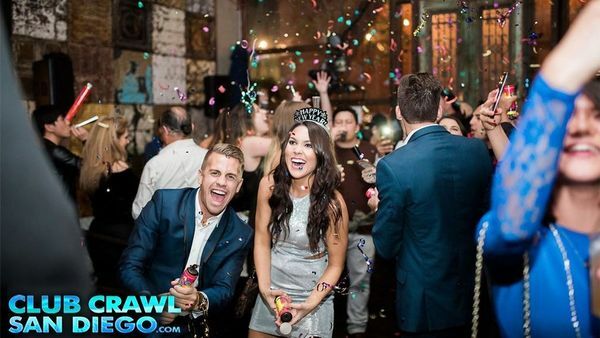 This is the San Diego New Years Eve event to organize a hassle free, unforgettable night out with your good friends. Dance in multiple rooms and open music format by San Diego’s best DJ’s. This event is expected to sell out. Purchase your advanced tickets now and see you in 2019! Table and bottle packages also available - please email events@clubcrawlsandiego.com for more information on pricing.